Sometimes you love an outfit combo so much you want to repeat it all over again. With a few changes of accessories you can make it feel like a whole new outfit! The outfits below are identical, except for picking a different colourful cardigan and bag each time. 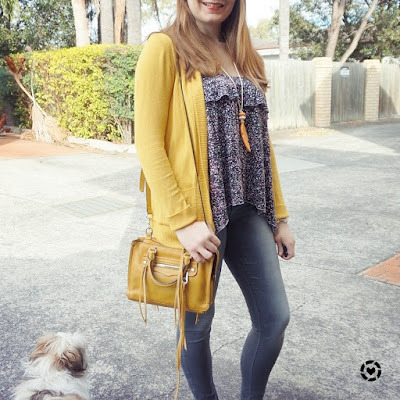 Accessories are a great way to change up an old favourite outfit - cardigans are good for spring, autumn or winter layering, so easy to take off when the day warms up (as it did both times I wore this outfit). It was a really warm day when I wore this and I actually regretted the decision to wear jeans at lunch time as we sat by the sea. The cardigan came off pretty quickly after the photo above by the water was taken! Had deliberately picked a red cardigan to wear with this even though the abstract floral print tank doesn't have any red in it. It was to tie in with the day's activities. Toddler T loves all kinds of vehicles, but he has a soft spot for emergency service vehicles. His aunt arranged for him to have a day out on a fire truck for his birthday. Took a while for everyone to be free for it, but it was worth the wait. It was an incredible day out riding around in the fire truck, seeing the sights and getting a chance to play with the hose. The bag was another practical choice for the day - we were keeping the experience a secret until the very last moment for Toddler T, so I had to hide my camera as well as his little Fireman dress up uniform. This Rebecca Minkoff MAM is perfect for carrying all my usual things and leaving room for a little extra too. First time I've been without the baby bag in years, as Baby Boy stayed with my mum and she had the bag and stroller. I was pleased with how much this bag held. While this outfit was a little warm for the day which heated up so much in the afternoon, it was otherwise very comfortable and I liked the combination so much I wore it again similarly not long after. Last worn: red cardigan, grey skinny jeans, Converse, Rebecca Minkoff MAM. First time I've worn the tank as I recently got it from my sister's wardrobe clearout. Other ways to wear: red cardigan and maxi skirt, grey skinny jeans with pink and purple, Converse and flares, Rebecca Minkoff MAM and monochrome maxi skirt outfit. Perfect for pregnancy: red cardi and hidden second trimester bump, MAM bag and maternity office wear, Converse in the first trimester. Since I liked the outfit above so much, I decided to wear it again and just swap out the cardigan and bag. While the base outfits are identical (even wore Converse and the same necklace with both) I think this looks different enough with the yellow accessories instead of red. It was slightly amusing that I ended up taking the cardigan off during the day too as it heated up. I headed out to my first Babes & Picnics event - worth checking out the organisation if you're an Aussie mum. The event was a fundraiser for the RSPCA cupcake day so of course we had to enjoy a few cupcakes with our picnic lunch! By the time we sat down to eat though the boys and I were shedding the layers - the overcast morning quickly cleared up to a warm day. 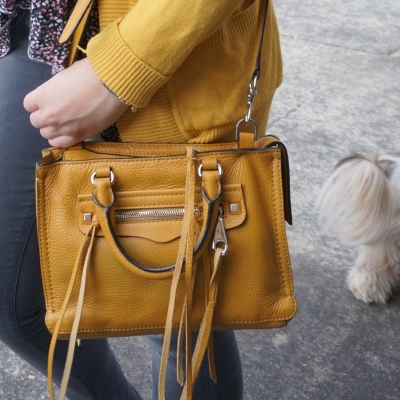 I frequently wear this mustard yellow cardigan and Rebecca Minkoff micro Regan bag together, it's a nice combination even though they are different shades of yellow. And I really want to get as much wear as possible from this cardigan before the warmer spring weather sticks around. Last worn: mustard yellow cardigan, floral ruffle tank (above), grey skinny jeans (above), Converse (above), Rebecca Minkoff micro Regan bag. Other ways to wear: mustard yellow cardigan and maxi skirt, grey skinny jeans and purple cardi, Converse and a printed dress, Rebecca Minkoff micro Regan bag and denim shorts. Perfect for pregnancy: Converse and second trimester travel. Repeating outfits is a quick and easy way to get dressed when you're pushed for time in the mornings or you're feeling uninspired. If you loved wearing something once, it makes sense to repeat it again! It's only an outfit rut if you're bored with it, other wise it's a style uniform! 😉 If you do want to change up your outfit you can easily swap out the accessories and make it look a little different. Plain but colourful cardigans can be an instant update to an old favourite outfit combination. Linking up with Friday Favourites, Mummy Monday, Modest Monday, Mix It Monday, On Mondays We Link Up. 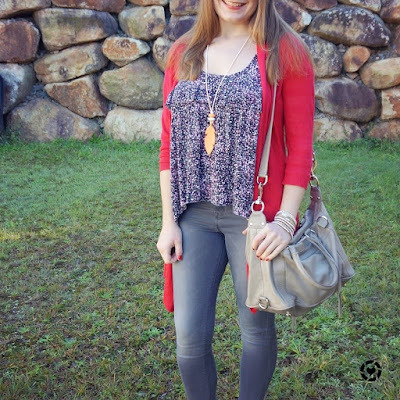 i love the color that these cardigans add to your outfit! I love both of your bright cardigans! Almost all of mine are neutrals. I need to change that asap!! I almost always have one for at the office, perfect in the aircon! I'm a huge believer in accessorizing!! In fact, I feel naked without them!! I am really loving both of these looks! It is so interesting to see how different they are with just different cardigans and bags. I am thinking I need to add more colored cardis to my wardrobe as I usually stick to neutrals. I bet he loved the day with the firetruck! Fabulous cardigans, and both in such nice bold colours! Looking awesome, Mica! Hi Mica! The fire truck sounds very exciting!! Very cute looks! It's amazing how accessories can update a look. You accessorized beautifully and I adore the bold colors! I want one cardi for the autumn season so thanks for the inspiration. Have a blessed weekend! I love that you chose a red cardigan in your first post as red is all the rage for Fall and Winter 2017. I just picked up a few red pieces and I can't wait to be sporting it for the coming months. The mustard yellow is a perfect Fall color too! Yes it's nice to see so many brights around for autumn and winter! It's a lovely outfit! I love mustard yellow, but I think the red suits you much more! 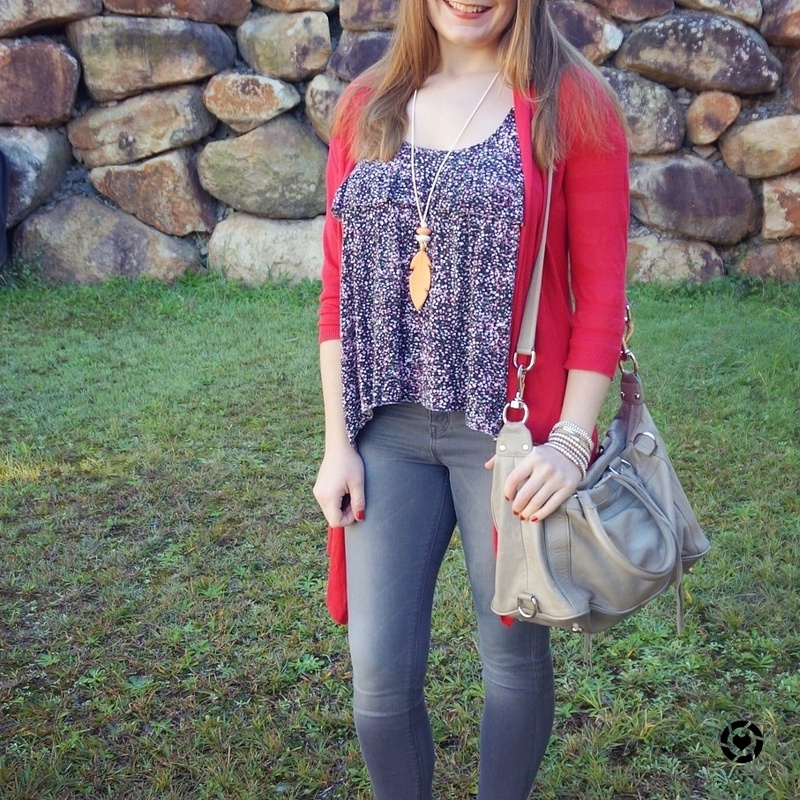 I love those printed tops with cardigans Mica! I bet toddler t had an awesome day out with the fire trucks! So cute. I seriously love the way you use such bold colours, Mica! Those mustard tones suit you perfectly and I love the red too! Loving these cute bright looks! That yellow bag is gorgeous! I didn't realize at first it was the same shirt! That's awesome! Need to invest in some of those cardigans! It is awesome when he wants to photobomb! I love how just changing up the cardigan and bag can really change the whole look! I'm such a big fan of colorful cardigans too. What a fun surprise for Toddler T! I bet he loved that! Jona would like that too--over the weekend we went to this Touch A Truck event where he could see emergency vehicles and other trucks up close. It was a little loud for him, but it was fun! Oh that would be such a fun event! I like the lighting in these pictures and the combos.Now that you're talking about your cardigans I am SO UPSET that I left mine behind. I am on a business trip in Colombia and weather is about 15 and all I brought with me is one pink pashmina. I am freezing.